The hilt and scabbard mounts chiselled and blued against a gilt ground, by Emanuel or Daniel Sadeler. A system of fencing which used a dagger defensively held in the left hand was introduced in the first half of the 16th century. It remained popular in Spain and Italy throughout the 17th century. 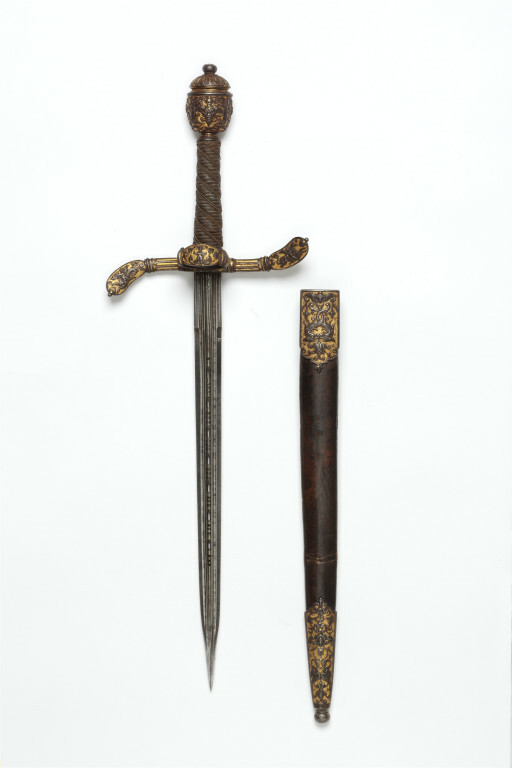 The blade of a 'main gauche' or 'left hand' dagger was usually straight and double edged, frequently with prongs or serrations designed to catch an opponent's blade. 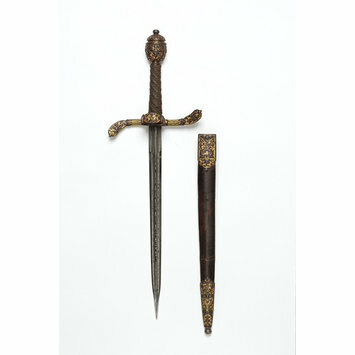 The counterguard of Spanish daggers was often triangular and the guard was usually decorated en suite with the rapier. Patterson, Angus, Fashion and Armour in Renaissance Europe: Proud Lookes and Brave Attire, V&A Publishing, London, 2009, ISBN 9781851775811, p. 61, ill.